At railways, the audible is almost exclusively emitted by wheels and rails. Here, the wheels are vibrating in their specific resonances. Schrey & Veit wheel dampers VICON RASA are fixed to those areas of the wheels, which are vibrating with the highest magnitude. This is considerable reducing the noise already at its source. The wheel dampers VICON RASA consist of individually tuned combination from metal and elastomer plates. This generates a counterforce to transform the vibration in thermic energy. Due to the small vibration energy amount, the wheel is virtually not heated up. The wheel dampers are effectively reducing rolling and squealing noise. This is kept long-lasting over the wheel’s life time. Many noise measurements have proven the benefit of wheel dampers VICON RASA. The results of an Amsterdam tram application measurement are shown in the following diagram. 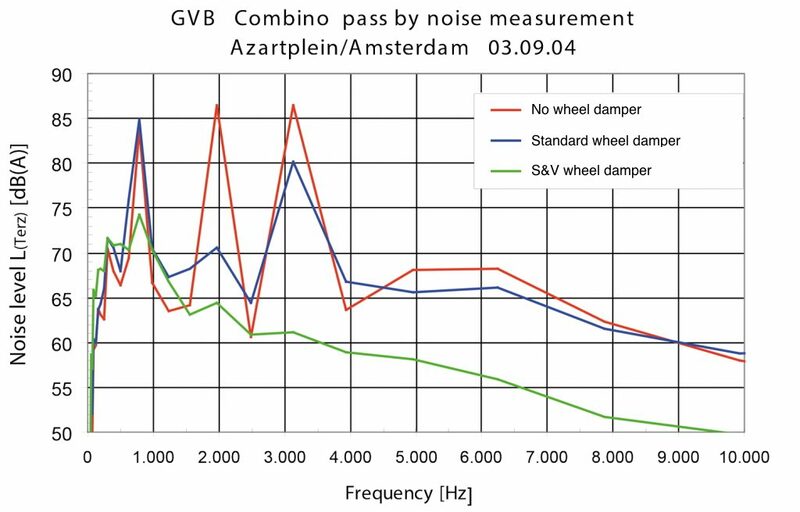 Compared to a ‘squealing’ vehicle without dampers (red), no noise peaks are visible at the vehicle with Schrey & Veit wheel dampers VICON RASA: The curve squealing is totally stopped. An alternative, not tuned wheel damper (blue) shows a strongly limited impact. This effect was confirmed at many other measurements. The high frequent squealing noise is eliminated and the tram runs, from the acoustic view, in curves equal to tangent track sections. This is an important advancement for humans and the environment. Beside the figures and facts, the video clip gives a direct feeling of the damper’s effect. Also on straight tracks, the low rolling noise is an important target. With Schrey & Veit wheel dampers VICON RASA, the sound emission of the wheel is maximal reduced. The specific vehicle type is from less relevance – up to now, at heavy rail locos, freight wagons and coaches been improved, as well as tram, metro and mountain vehicles. According the operational and track conditions, the noise was reduced by up to 6 dB. The tuning of the Schrey & Veit wheel dampers VICON RASA is based on vibration measurements of the specific wheel. Preferably, this process is executed at Schrey & Veit laboratories. If, for example, the wheelset cannot be removed from the bogie, this can also take place at customer site. By a modal analysis, the change in the vibration magnitude of the wheel and thus the effect of the damper can be determined. If the vehicle has already been in service, air borne noise measurements are welcome to identify the annoying frequency range(s). Schrey & Veit wheel dampers VICON RASA are available in different construction types. They can be mounted radially or axially on the wheel – either directly to the wheel or at supporting segments, which are braced in the wheel. Both attachments guarantee the highest safety level. If any confirmations on mechanical and/or thermical impact are required, please contact us to identify an appropriate approach. Within the “LZarG Leiser Zug auf realem Gleis” (Quiet train on real track) and “Forschungsprojekt Eisenbahnlärm” (Research project railway noise), supported by the Federal Ministry of Economy and Technology (Germany) resp. Federal Office for the Environment (Switzerland), extremely heat-resistant wheel dampers for block-braked freight wagon wheels had been developed. They are applied on a wheel type of the cooperation partner GHH Radsatz – this is compatible with most of the European bogie types. They have now been completely homologated and have proven their worth in multi-year, Europe-wide operational trials. Measurement results according ISO 3095, therefore comparable to TSI Noise, are shown in the diagram.